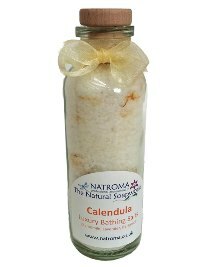 We love taking long baths, so we've created these handmade bath salts for the times when you want to enjoy a nice long soak. This is a new formulation containing Epsom and Marine salts, and we've added in extra botanicals and a luxurious blend of essential oils - making them just perfect for relaxing at the end of a long day. 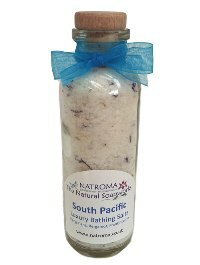 Our bath salts are handmade and presented in tall elegant glass bottles with natural cork stoppers and a pretty ribbon decoration. 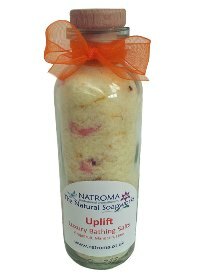 Base Ingredients: Epsom salts (magnesium sulphate),Marine Salts (maris sal), some varieties also contain Himalayan salts, botanicals and essential oils. Soothing Lavender, Geranium, Bergamot, Patchouli and Roman Chamomile essential oils, and a sprinkling of golden calendula petals. Relaxing Lavender, Bergamot, Mandarin and Roman Chamomile essential oils with ground lavender and a sprinkling of blue mallow petals. 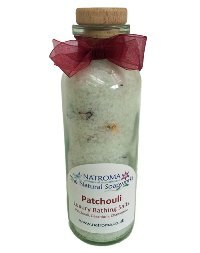 Skin soothing Patchouli with Chamomile and Geranium essential oils, and a sprinkling of chamomile and rose petals. Sweetly scented Palmarosa and Geranium with earthy Patchouli essential oils, with pink Himalayan salts a sprinkling of rose petals. A sweet, exotic blend of Ylang Ylang, Patchouli, Rosewood with a hint of refreshing Lime, with pretty cornflower petals. 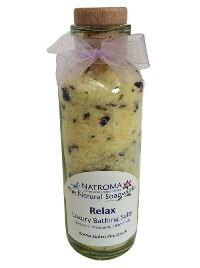 Ingredients: Epsom salts (magnesium sulphate), Coarse sea salts (maris sal), Ylang Ylang (cananga odorata), Patchouli (pogostemon cablin), Rosewood (aniba rosaeodora), Lime (citrus aurantifolia) essential oils, and cornflower petals. Zesty Mandarin, Grapefruit and Lime, sweetened with luxurious Rosewood essential oils, with a sprinkling of rose and calendula petals.